The team that created My Space Plant Pod Project (MS3P), a zero-gravity agricultural environment with its own atmosphere, will create a video for the international finals May 22. 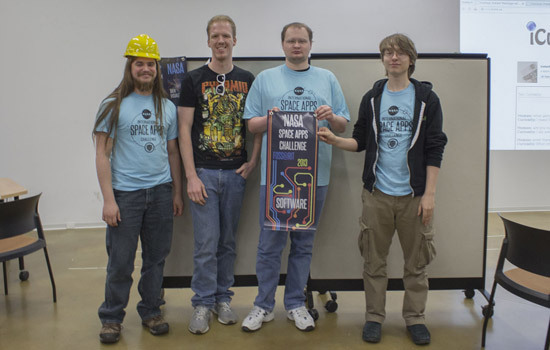 Five groups of local innovators were winners in the NASA Space Apps Challenge held April 20-21 at Rochester Institute of Technology. Two of those groups will move on to the international round, where the Global Best in Class awards will be presented May 22. The Rochester community joined more than 9,000 people in 83 cities for the largest hackathon ever held. The challenge gathered 40 students, faculty, staff and community members to engage directly with NASA in building projects that use data from NASA for education and other citizen centered efforts. 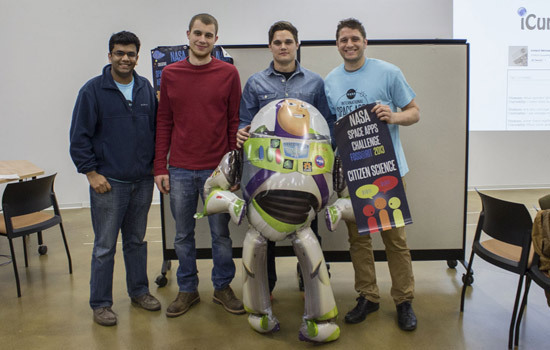 Problem solvers in the competition tackled all 58 challenges presented by NASA by developing software, building hardware and creating data visualizations that together resulted in one giant leap toward improving life on Earth and life in space. The Rochester community submitted proposals for 12 problems, with two groups moving on to the international competition. “Projects included two smart jewelry creations, efforts that use new technology like the Leap Motion Gesture controller and hacker boards Raspberry PI and Arduino and even an effort to support inner-city homestead chicken flocks,” says Remy Decausemaker, a FOSS@RIT research associate and organizer of the challenge. 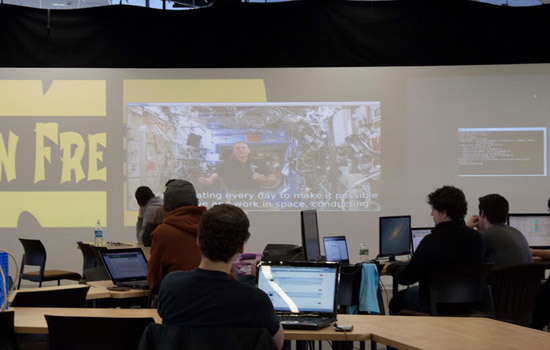 While the Space Apps weekend is over, the global competition is still moving on. Local winners will send in short videos for the finals, explaining what their project can be used for. Nominees from Rochester for the global competition are SpaceHub, a hosted source management service that simplifies the management of projects, and MS3P, which stands for My Space Plant Pod Project, an educational and modular greenhouse that uses a Raspberry Pi to introduce technology used in space and to empower students to begin learning computer science. • Creative: Solar System Sombrero, a hat mobile of the solar system, created by Jen Kotler. • Data Visualization: Climate Time Machine, a project that shows climate change over the years since Earth Day was started, created by Andres Ruiz, Jared Smith and Brian To. • Citizen Science: My Space Plant Pod Project (MS3P), a zero-gravity agricultural environment with its own atmosphere, created by Sean Pettison, Sajin George, Jordan Darling, Jill Dotty and Taylor Swanson. • Open Hardware: PiLink, a system that connects Raspberry Pi and Arduino boards to communicate from space, created by Sajin George. • Software: Space Hub, a system that aggregates all of NASA’s widely dispersed source code and data into one central hub for easy access, created by Ryan Scott Brown, Gregg Jurman, Sam Lucidi and Ross Dellinger. The team that created Space Hub, a system that aggregates all of NASA’s widely dispersed source code and data into one central hub for easy access, will create a video for the international finals May 22.